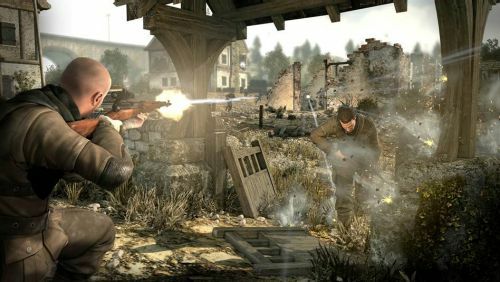 Sniping has always been a staple in shooter titles, but it takes a truly special game, such as Sniper Elite V2, to take it to a whole new level, specifically for co-op gamers. After listening to their fans frequent requests for more co-op related content in the game, developer Rebellion is giving them exactly what they want with a specifically designed update solely for co-op gaming! "We decided to focus on co-op play for PC for several reasons. When we announced that we were self-publishing the PC version of Sniper Elite V2 we stressed that we would continue to support and improve the game over time – to that end we’ve been regularly updating multiplayer with new maps along with paid DLC through Steam. All through the process we’ve been listening to fans of the game – many who have been long-time supporters of the original Sniper Elite game – and one of the things they asked us to look at was co-op play. Self-publishing a title gives us the unique opportunity to respond directly to what the fans want, and so this massive free DLC is for them!" Wave-based, “hoard mode” type of combat scenarios, having two partners using their wits to outlast increasingly more potent opponents rising in number. Just like in the authentic experience of the single player gameplay, players will be able to use various traps and mines to help protect critical positions around the maps, as well as to keep a safe distance between the enemy and themselves. The well-known multiplayer map, "Graves", has been converted and enhanced specifically for co-op play, whereas the brand new map, "Arms Race", was created just for this co-op mode alone. An upgrade to the very successful “Overwatch” co-op mode, this gametype calls for critical teamwork of both players. One sniper takes the objective of keeping his buddy safe from a vantage point, as his partner completes various challenges surrounded by opposition. Whether it’s a rescue, sabotage, or recon mission, pure co-op is the name of the game. Alongside these two co-op additions to the DLC, Rebellion will also be launching a new "Fuel Dump" paid DLC exclusively for PC owners of the game. The "Fuel Dump" mission, that takes care of some of the issues players have previously raised about the game upon release, has removed linear gameplay and gives them a much larger play area to work with (great for larger shooting distances). Also, the new M1 Carbine and Webley Revolver guns will also come with the DLC to throw a couple new weapons to your sniper's repertoire. Although this DLC is aimed specifically for PC gamers, console gamers shouldn’t get discouraged reading this, as you’ll be getting something here as well! Along with Rebellion’s co-publishers, 505 Games, they have most recently announced that the console versions will soon be getting a free multiplayer update of their own (not found in the original game, we might add). "Rebellion is very excited to release this multiplayer support for console,' said Jason in the announcement. 'We have always believed in supporting and building our games’ communities as best we can. This is in part to say thank you to dedicated gamers for buying our games." The console multiplayer DLC will add four online modes: Team Deathmatch, Deathmatch, Team Distance King, and Distance King, to their Sniper Elite V2 libraries. There will be no plans of releasing the co-op modes mentioned previously for console versions of the game, unfortunately. This update will soon be live on Steam, so don’t worry about waiting too much longer for more sniping action. Check out the gallery for the DLC below and be sure to keep an eye out for the update on Steam once it hits. Co-op gamers have been heard and Sniper Elite V2 has answered the call with flying colors! Let's all continue to support them and their amazing efforts in making co-op gaming their highest priority in development.